Great things to do in Charleston. The reunion committee hopes for a large turnout. If you are planning to attend and haven’t submitted the official reunion registration form, click here now and get that done. Be sure to submit your registration fee and book your hotel room. 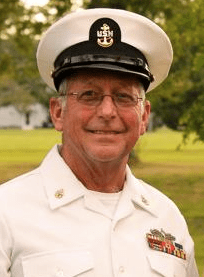 We are fortunate to have a shipmate and committee member — Lee Samuelson — who lives in the Charleston area. As official reunion host, he will be able to answer questions and make suggestions about how to get the most out of your visit to Charleston. The committee, with Lee’s direction, will compile and make available a comprehensive list of group and independent activities from which to choose. It will include some of what you see on post; I’m providing this as both a preview for those who have already registered for the reunion, and incentive for those who have not. I hope you will browse this page, make note of my insights into activities and attractions I enjoy, and share with shipmates who need a little extra push to convince them that the reunion will not only be fun, but that Charleston is a wonderful place to visit. My responsibility as a member of the 2015 reunion committee is communication. I thought it appropriate to share some of what Charleston offers. I know a good amount about this wonderful southeast community because I’ve visited there a dozen times over the past six plus years; my youngest son attending college there and then settling down nearby with his South Carolina-born wife. My wife and I love Charleston, and have taken advantage of our visits there to experience as much of the area as possible. This post will highlight some of our favorite places and activities in hopes that it help you get the most out of your visit. And if you’re on the fence about attending — if hanging out with a bunch of virtual shipmates isn’t enough — knowing a little about what Charleston has to offer could push you over the top. Photo taken from a sailboat harbor tour described below. 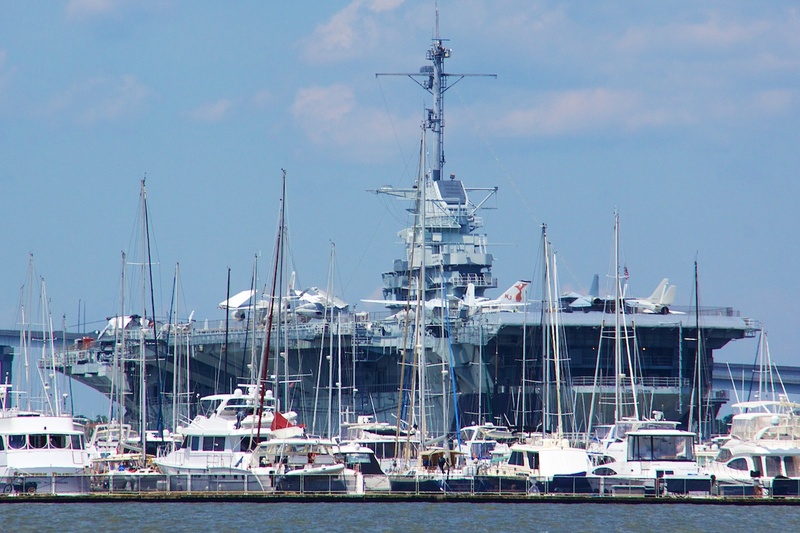 Patriots Point is probably the biggest attraction for a group of old sailors. The reunion committee is organizing a visit as our main group activity on Friday, April 24. Plans for our visit are still being made, but I can tell you that we will have plenty of time to tour the ships, submarine and other exhibits, and we’ll eat lunch off metal trays in the USS Yorktown CPO Galley. Be sure to sign up for this outing in the reunion hospitality room. Visit the Patriots Point website. 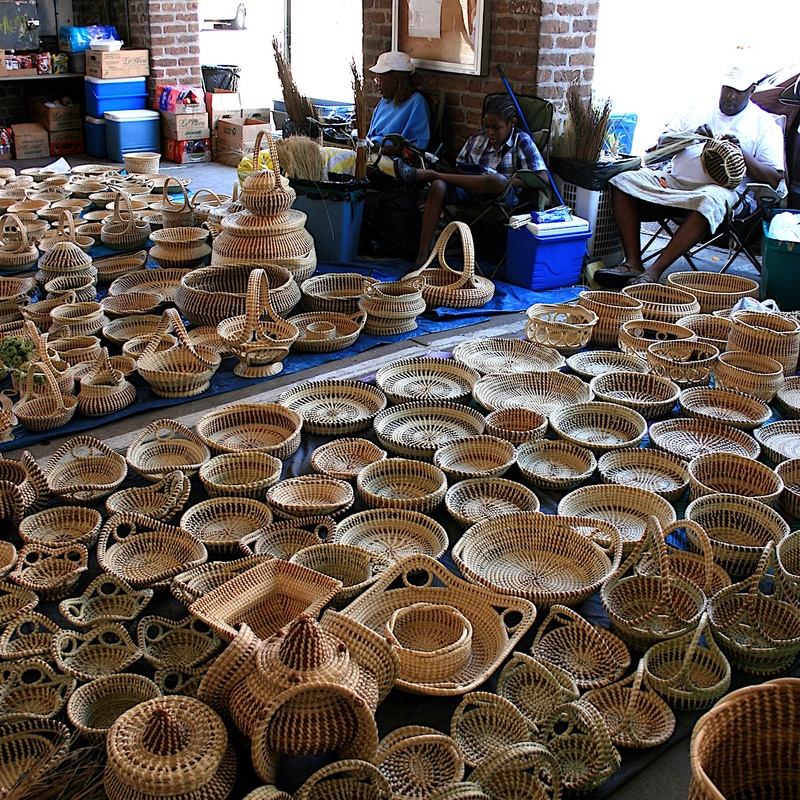 The photo at the right shows one of several vendors that sell intricate and artistic baskets woven from sweetgrass. 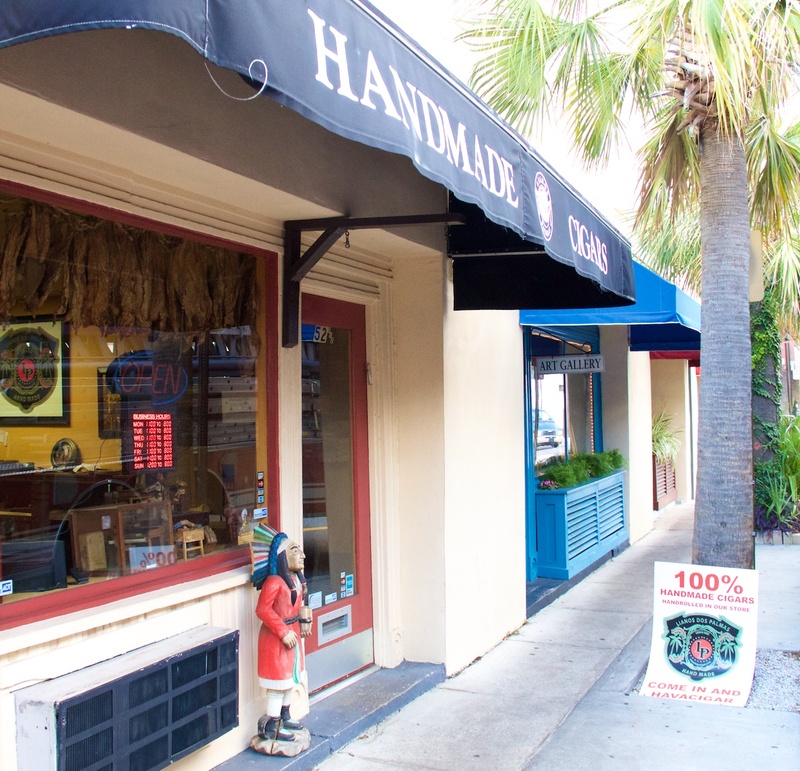 You’ll also find some of these sweetgrass artisans along nearby streets if you venture out beyond the historic district and into the residential neighborhood just a few blocks to the south. But in the market, besides sweetgrass baskets, you’ll find a wide variety of shops and kiosks selling everything from t-shirts, to jams, to jewelry and more. The three block long market is packed at peak hours with tourists looking for bargains on low-country souvenirs. This is an especially unique shopping experience. Visit the Charleston Historic City Market website. I never took one of these tours because I’ve had some pretty knowledgable personal guides with me. I can tell you that the self-guided walking tours are a good way to do it if you have the time and energy, but if you prefer to learn about the history of this beautiful and historic city in comfort, you’ll get it more efficiently if you go on one of these horse-drawn tours. The tour guides know their stuff and treat their passengers to the highlights of the city’s history as well as humor and interesting trivia. 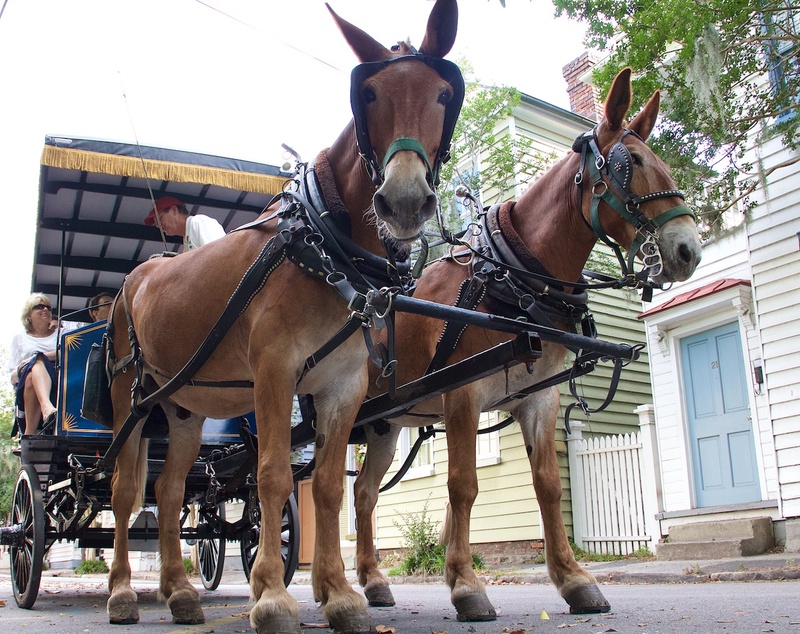 Visit the Palmetto Carriage Tours or the Old South Carriage Tours website. With a history that includes the Revolutionary War, the Civil War and pirates, The Battery and White Point Gardens, also known as The Battery, is a great destination by car, but is even better by foot. 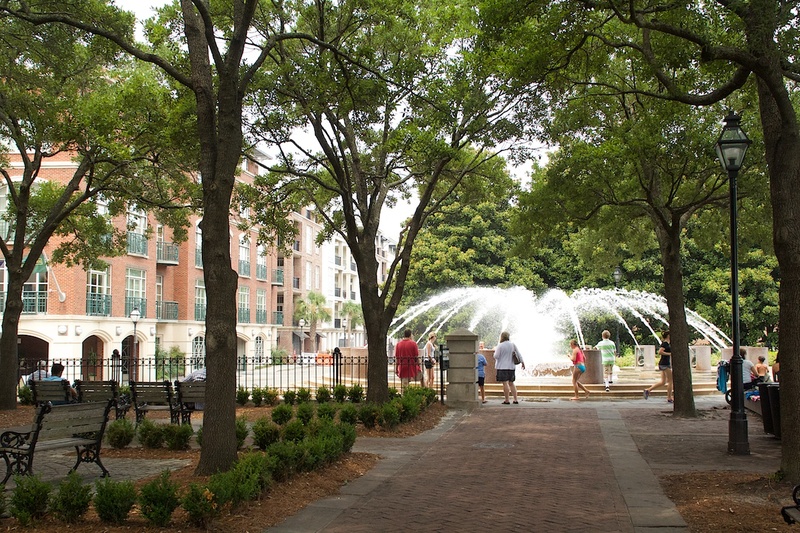 Starting at the west end of Charleston City Market, walk straight south on Meeting Street to the park. The less-than-one mile walk takes you through a great neighborhood of beautiful, well-kept southern-style homes. The park features cannons from the Civil War artillery battery and a wonderful panorama of the south and east areas of the harbor. And to make your walk even better, I recommend returning to the market via the shore, heading north on East Battery Street, which turns in to East Bay Street, and turning right on East Adgers Wharf through Waterfront Park. I estimate the round trip to be 2 miles, exercise I will surely need after so much reunion revelry. Deb and I will probably include this in our Saturday free time activities in downtown Charleston; if you’re interested, let me know and we’ll be glad to take you along. Visit the White Point Gardens website and The Battery on Wikipedia. About a half mile walk from Charleston City Market is the beautiful campus of the College of Charleston, the oldest college in South Carolina. Unlike almost every other college or university campus you’ve seen, this one retains the old southern charm it must have had when it was founded in 1770. 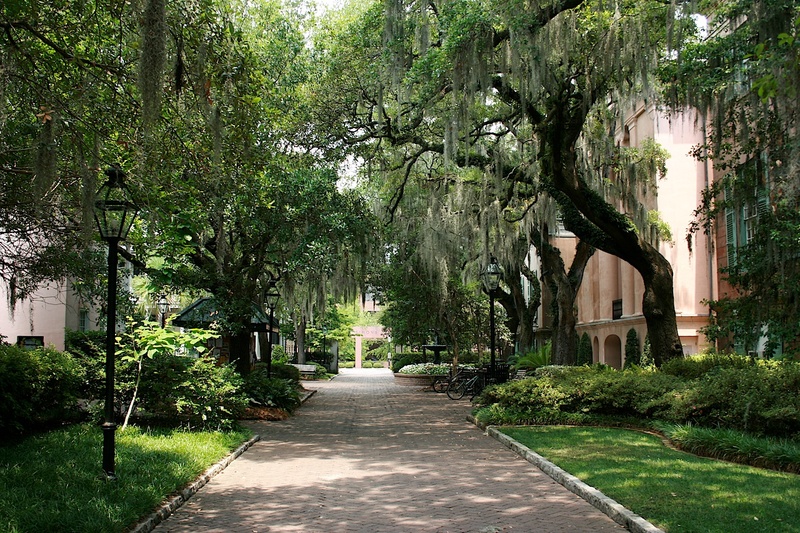 The buildings, many of them resembling large residences, and the ample shade trees draped with Spanish moss, make a stroll through the campus a visual pleasure. 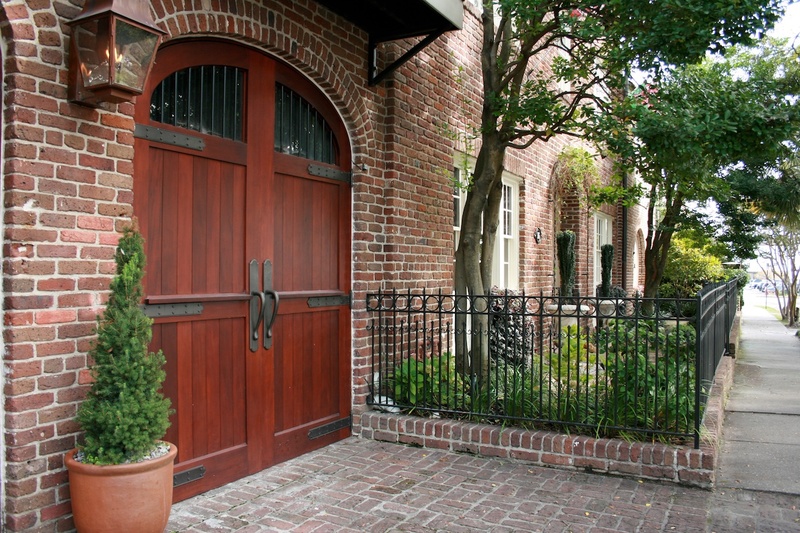 On your walk from the market to the college, you’ll pass through the retail district of downtown Charleston, where you’ll find numerous stores, shops and restaurants. Visit the College of Charleston website. 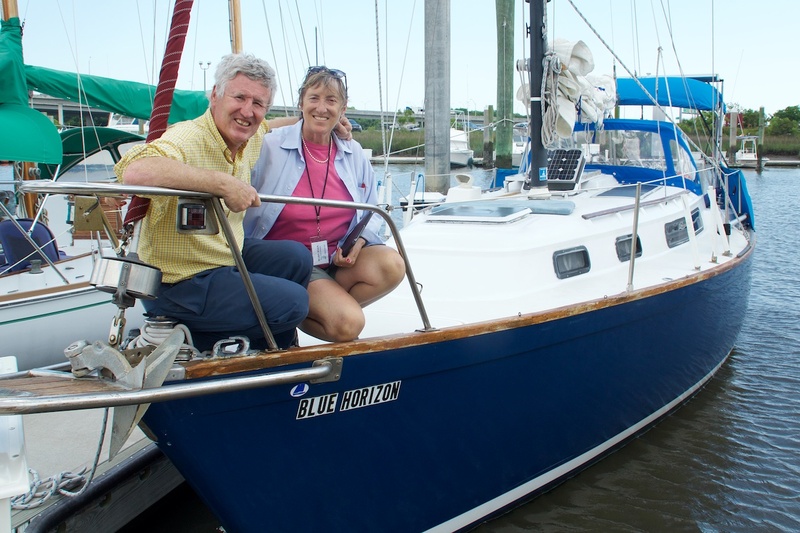 Shipmate Jim Richardson has offered to provide a day of bareboat sailing on Saturday, April 24th. He will be recruiting sailors among us to crew this craft, hopefully a Bavaria 39 foot. A signup form will be provided on this website beginning in March. With that said, if you prefer not to be a part of this salty crew, but have interest in enjoying on a more leisurely guided tour, I suggest the Blue Horizon. I discovered this option when my son treated Deb and me to it as his Father’s Day gift in 2012. Captain Paul Mitchell and his wife provided a grand tour of the harbor, pointing out significant Charleston landmarks and offered insights in Charleston’s nautical history. We found this aquarium’s 60 unique habitats and 385,000-gallon Great Ocean Tank to be as enjoyable as what we saw at the world famous Shedd Aquarium in Chicago. 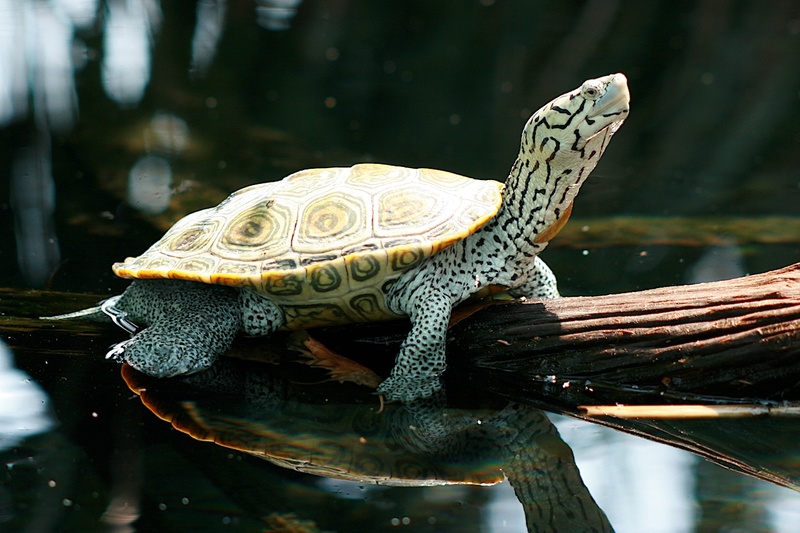 Visit the South Carolina Aquarium website. I don’t buy a lot of cigars, but when I do, I buy them at Lianos Dos Palmas in downtown Charleston. If you’ve ever been in a cigar shop, the first thing you notice is the cigar smoke. Not so much here; because they roll them fresh on the premises, the smell of fresh tobacco is prevalent. Walk in and watch the expert roller at work. The cigars they sell are high quality and very reasonably priced. Let me know if you’re interested when we’re in downtown Charleston and I’ll take you there. Otherwise, check their website for a map. It’s just a few blocks from City Market. Visit the Lianos Dos Palmas Cigar Shop website. The weather is not likely to be anything like it was when I took this photo at Isle of Palms in June, 2012. 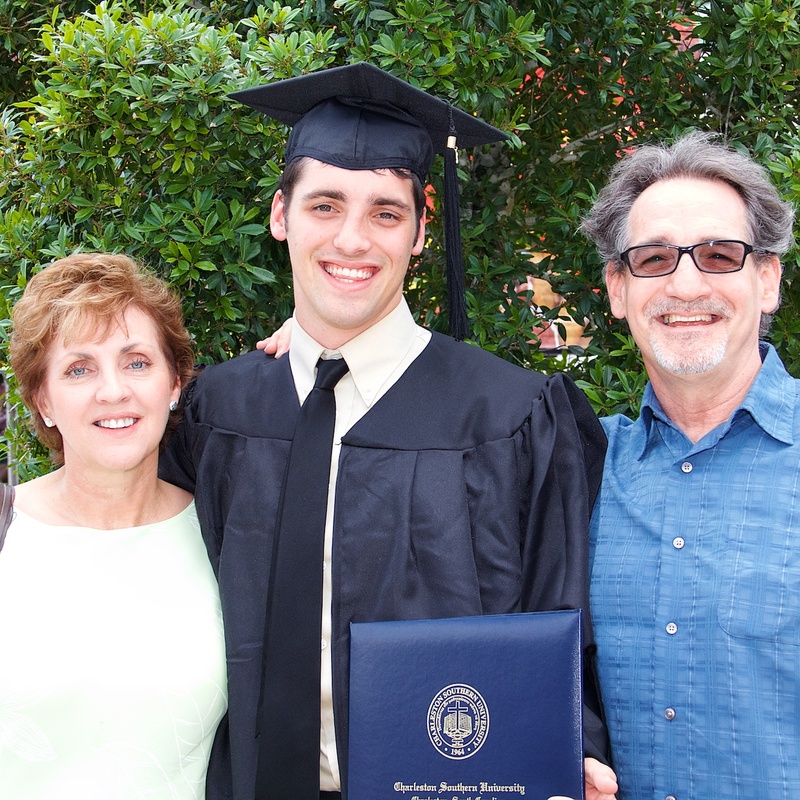 We were in Charleston for my son’s graduation from Charleston Southern University. 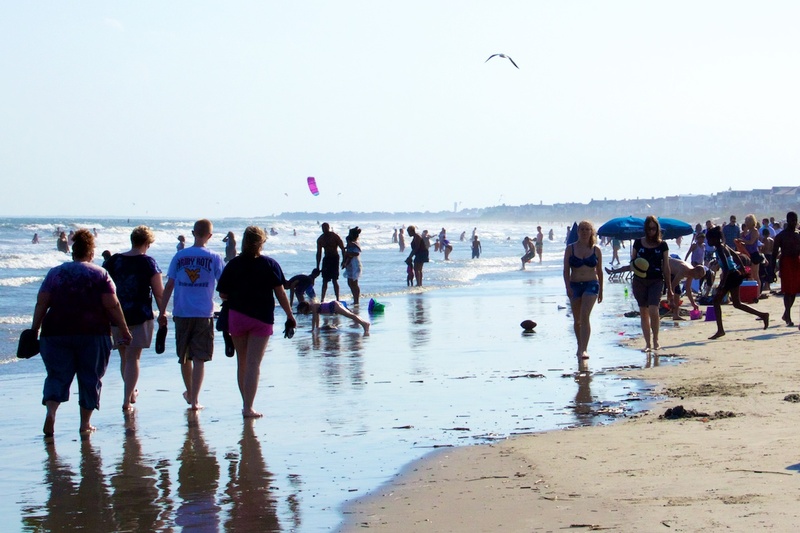 If you’re inclined to visit the beach, even if it’s just to take off your shoes and walk along the sand, there are two beaches within 20 miles of downtown Charleston. Visit the Charleston Convention and Visitors Bureau’s Isle of Palms page or Folly Beach page. Deb and I visited this site on one of our southeast road trips on our way back from visiting friends in Hilton Head. It’s over an hour away from the hotel, but if you appreciate pre-independence history and architecture, you’ll enjoy visiting these ruins. The church was built between 1745 and 1753; the walls and columns still stand. The original church was burned by the British during the Revolutionary War and rebuilt in 1826. It was burned again in 1865 by General Sherman in his march from Georgia to South Carolina. 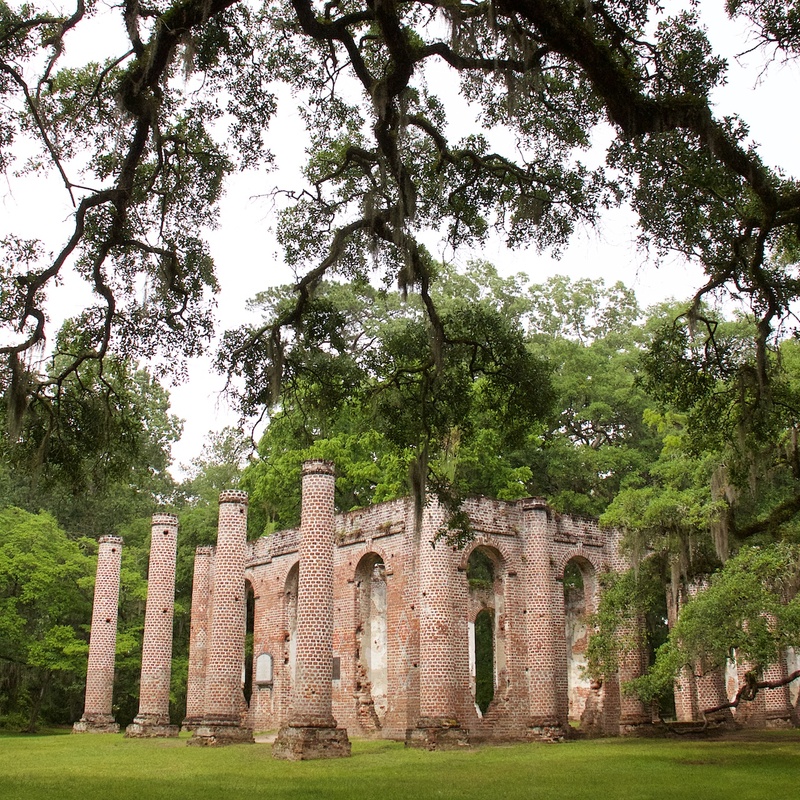 The grounds and the ruins are one of the most picturesque scenes I’ve seen in my many travels to South Carolina and Georgia. I rank this site right up there with God’s beautiful sunrises over the Atlantic Ocean. Be sure to take your camera if you visit the Old Sheldon Church Ruins. Visit the South Carolina Information Highway website. Just 11 miles from the hotel and approximately half way between the hotel and the Charleston Tea Plantation, Angel Oak helps make the drive worth it. This tree is estimated to be over 1,500 years old and its canopy covers 17,000 square feet. It’s pretty amazing. 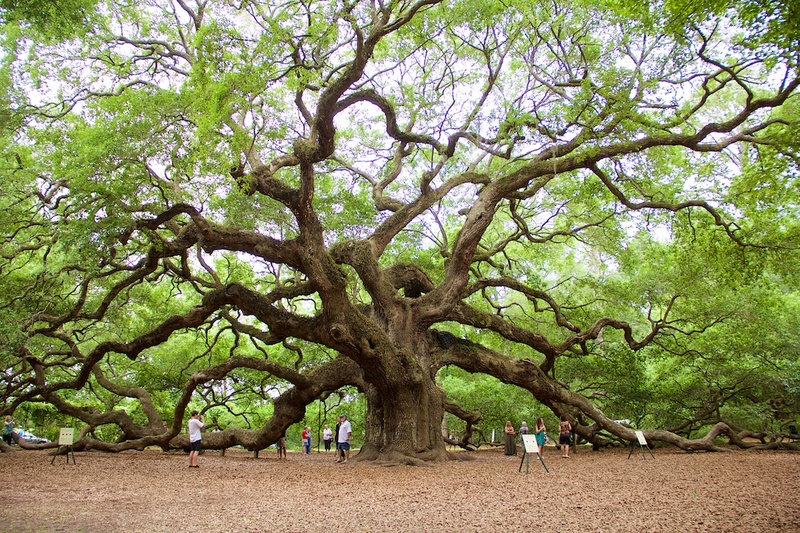 Visit the Charleston Parks Conservancy Angel Oak page website. Now, my wife had to drag me on this one. So guys, if you owe your wife a favor, consider the Charleston Tea Plantation. The 20-mile drive from the Holiday Inn Riverview takes you through the typical low country terrain and scenery, something you should experience if you are from west of the Great Smokies. The plantation is owned by the Bigelow Tea Company and is the only working tea plantation in the United States. Your visit includes a guided trolley ride through the 127 acre farm, a visit to their high tech propagation farm (my horticulturist wife was really excited about this attraction) and a chance to see the extensive tea processing plant. The tour ends in the visitors center where you can shop teas to please any taste. 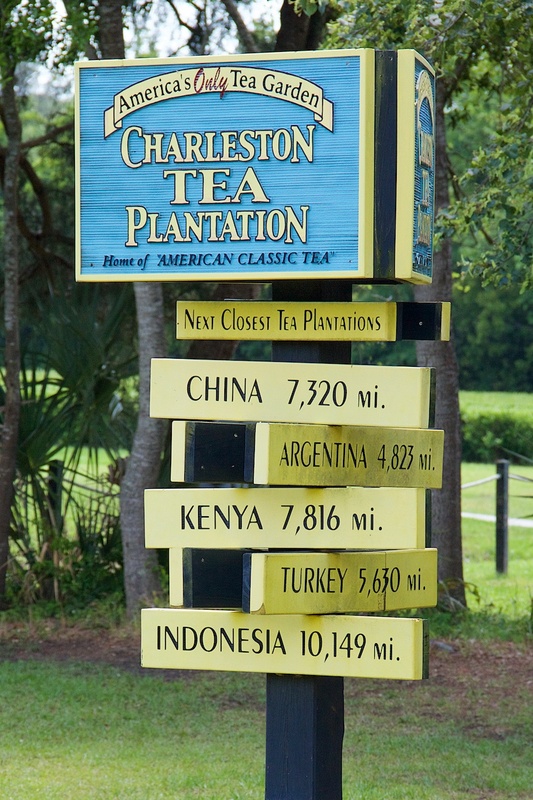 Visit the Charleston Tea Plantation website.